I remember way back when Wizards of the Coast still had official forums, there was an attempt by various members – a sadly long-lived attempt – to form cliques based on which one of Mark Rosewater’s player psychographics they most identified with. I describe this practice as sad because the fact is, we all have a little bit of different psychographics and goals within us. That’s what makes Nullhide Ferox so intriguing. The Timmy within us all licks his lips at that huge power and toughness and easy mana cost. The Spike within looks at that little word, “hexproof”, and then at the Obstinate Baloth-style clause, and dreams of giving fits to people who call on Liliana of the Veil. The Johnny within starts checking his collection for creatures and lands that mimic spells, and thinking about whether there’s a way to use the “loses all abilities” ability politically in Two-Headed Giant and the like. It’s huge, it’s cheap, it’s got good art; it’s got a name that could have come from Theros’ cleverer uses of Greek, and it’s somehow both unsolvable and fair. It’s just a great card no matter how you look at it. It’s large, lethal, and has a ruthlessly efficient death stroke. I suppose all of these are good things! Nullhide Ferox is a 4-mana 6/6 with Obstinate Baloth-style text: if you have to discard it, it comes into play instead of going to the graveyard. And not just a 6/6…a 6/6 with hexproof. It’s hard for most decks to trade effectively against Mister Biggles, outside of deathtouch. The “downside” is interesting, but leads to elegant design. Not being able to cast noncreature spells is not a massive downside…at least, if you’re building your deck carefully, it should not be! If it does become a problem, you can turn it off for a turn…which also removes Nullhide Ferox’s hexproof. The flipside also is true: removal carries a 2-mana premium, but them turning off hexproof means you can bamboozle them with some manner of trick to throw them off. (Keep in mind that you can still strip abilities from the Ferox after they are applied, if you have the mana to do so. 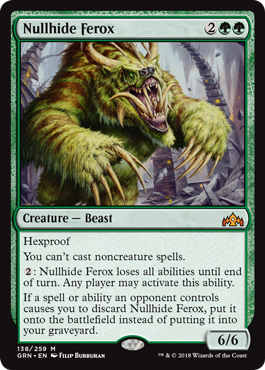 Nullhide Ferox is an intriguing design and, more than that, an absolute unit that can take over games if left unanswered. Solving it is a fun puzzle, one that can pay large rewards…and, if nothing else, making that Path to Exile cost 3 mana is an okay place to be.